Every time you make a purchase on SmokeTip.com you will earn Reward Points that you can use, same as cash, toward purchasing products on SmokeTip.com. At the bottom of each product page you will see the amount of points you will receive. 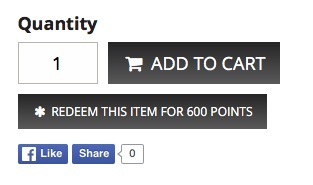 If you have enough points to redeem a certain products, a button will appear below the Add to Cart. You can choose to Redeem at that time or you can add to cart and save your points for another product. You can login to your account anytime to see your available points. It is important to create only ONE ACCOUNT - points cannot be transferred to another account or be combined with another account at any time.